They didn't go down in the valley of Kitkuay river all together. At first, probably, they stopped to reflect on the way. Five people dressed warmly and left. The remaining five, hoping that the scouts would return soon, spread out the tent and lay down on top of it. They could not pitch up the tent because of the strong wind. They didn't even bring they backpacks closer, or put on warmer clothes while waiting for the return of the ones that left. They could, but for some reason they did not. They were lying tight against each other. The last on the windward side tried to cover himself with the tent. Two of the scouts decided to return to the remaining group. The young Novosenov gave all his warm clothes to his female companion, and he himself remained in checked shirt. 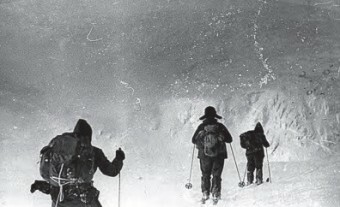 Altshuller and his two comrades descended safely to the valley, but they found themselves in a trap: they could not reach the village without skis, and they did not have enough strength to go back against the wind. The deadline of their return January 31 passed. The blizzard and strong wind prevented the landing of rescuers on the plateau of Chevruay. They got there on skis only on 6.II. 10 m from the cliff of the circus, five frozen bodies were found and not far away - two more. 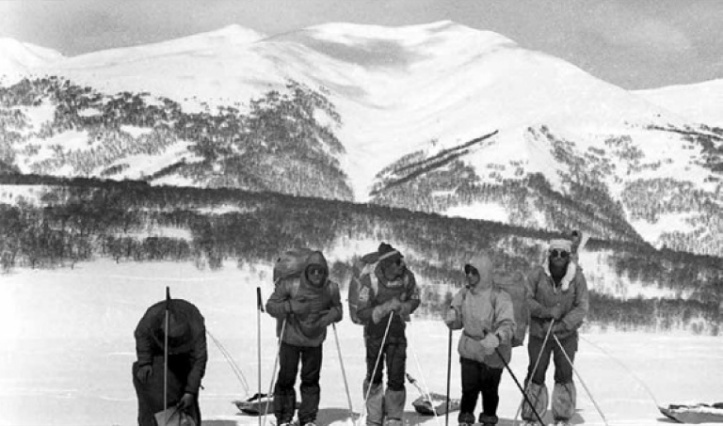 From the inscriptions "KuAI" on the skis and a notebook it became clear these were the hikers from Kuibyshev. The search for the rest continued throughout the month. On February 27 in the valley of Kitkuay river at the exit from the gorge in 2 km from the circus were found two bodies, 10 m from each other. Their watch stopped at about 5:00. Only on 1.VI the last member, Altshuller, was found at the right slope of the gorge 400 m from the place where the last two found died. He was warmly dressed, but without gloves. His watch stopped at 4:33. In addition we have the behavioral errors of hikers in the Northern Urals in 1959, their deaths were explained by other assumptions: military trials, UFOs, encounters with Yeti ... As arguments for these mystical theories are pointed the concealment of search materials and the involvement of KGB in the search etc. On February 7, 2013, on an Grushin Thursdays, in the Valeriy Grushin's auditorium at Molodogvardeyskaya, 151, hikers and relatives of the victims gathered. Much has been said about the students, about their friendship, about their youth. They are asleep. They dream of mountains. There is no time for rest. The pass awaiting them tomorrow. It was so hard to gather! They checked it over tirelessly. They will not be overtaken by defeat. And now they are sleeping quietly now. They seem to be near us. We all sit with a big family. No time for goodbyes and for tears. We look back forty five years.